I rember September 11, 2001 as a one of the most unforgetful day is US history. I rember seeing it all as it happend on T.V and radio. I rember when both of the towers collapsed, 1 life every second was lost. My father said that he was on his way to work, NREL, and when he was hearing the radio more than driving. Every time I look or talk about September 11, I think about the 3,000 people that lost their lives on that day but hey, it’s not the first time the World Trade Center was attacked. Although I was quite young on September 11, the one thing that I call “the heros” on 9/11 was random strangers helping the injured for the burning buildings. How old where you on 9/11? 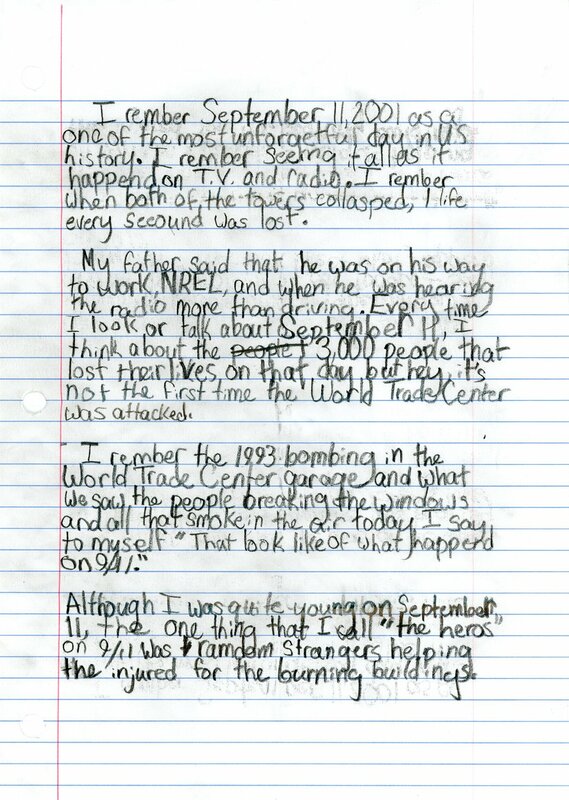 I was about 13 on 9/11. How did you discover this project? I found out about this was that one day I was with my friends and they were talking about your project and they said that you had a website for the flip book so I search it and I love of what you did. What do you think about the flipbook? I think of the flip book is amazing and touching because my 3rd Grade Teacher lost her husband on 9/11 in Flight 175.